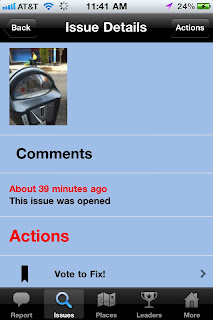 Ten days ago, SeeClickFixer Eric reported Issue #61872, debris in intersection through his SeeClickFix Mobile Application. Eric reported that there was "loose dirt, rocks, garbage, and debris in the intersection of Barstow and Alameda. This causes cars to lose control and run the four way stop." In one day, Albuquerque 311 Citizen Contact Center had responded to Eric, stating that "his request had been sent to the appropriate department for handling." Two days later, they reported that the Street Maintenance Division had swept the area! 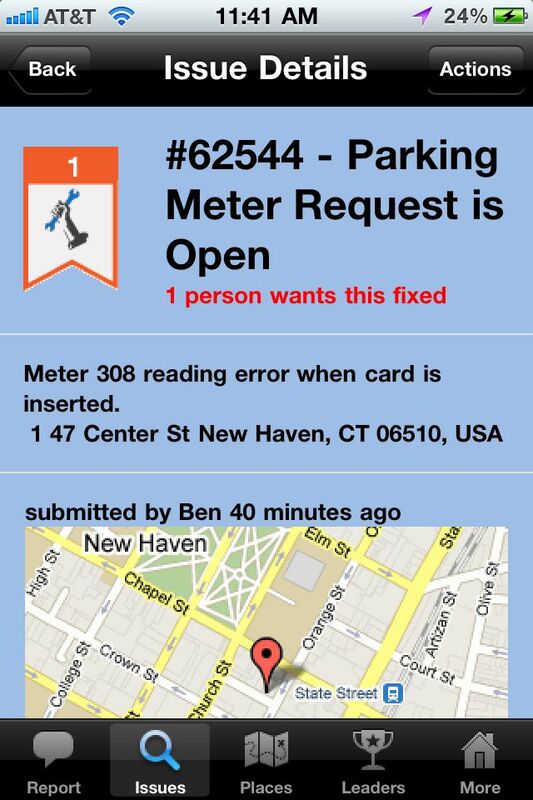 In less than 2 weeks, Issue #61451 was resolved in Providence, RI. Stephanie Gerson had reported that there was a leaning stop sign with graffiti on October 16th, while participating in her SeeClickFix Storm. Four days after the issue was posted, Jason Rodrigues had stated on SeeClickFix that a work order had been put in to "replace the defaced stop sign and straighten the bent u-post on Williams St. @ Brook St." A week later, the stop sign had been replaced and the bent u-post was straightened. Great job Providence! Issue #42101 was investigated by WECT, which reported a dangerous intersection between Village Rd, Old Fayetteville Rd and S. Navassa Rd in Leland, NC. After WECT investigated a little further, they found that the North Carolina Department of Transportation will be working hard on fixing this intersection. They reported that "crews are widening the road and making other changes," and that the construction is projected to be completed next summer. HeatWatchNYC and SeeClickFix have partnered together to help citizens in New York City report heat and hot water issues within their neighborhoods. Currently, there are a total of 80 issues reported concerning heat and hot water issues in the HeatWatch NYC watch area, with 59 of them open and 21 already closed. So far Angela Thorton, Council Member James S. Oddo's Deputy Director of Constituent Services, has played a great role in acknowledging the heat and hot water issues reported on SeeClickFix. HeatWatchNYC not only provides a tool for citizens to report their heat issues, but also includes information on getting involved in your community and knowing your rights as a tenant. HeatWatch NYC was created by Penny, who has worked hard to help NYC citizens with their heat and hot water issues on SeeClickFix. Thanks Penny! While sitting in a breakfast meeting on disrupting the Public Schools this am it felt very appropriate that we were given an opportunity to reap the benefit of previously successful disruption. This was truly an exciting moment for me as it symbolically marks the success of a social mission to make our own government more open, accountable and efficient while encouraging citizens to be more engaged in a productive way. Imagine an unendorsed, unfunded, undesired and unrequested service not only sending the existing service (WebQA) into obscurity but replacing it in its entirely. All while carrying the weight of a cultural shift in how we as citizens interact with each other and our government. By a democratic process the citizens of New Haven voted for open and accessible government through the tools they chose to use to connect with government. And through effective leadership the City of New Haven chose to listen and adapt to the voices of their citizens. Once we could only have access to a blackbox of communication by leaving a voicemail or filling out a lengthy form with too many personal questions when we wanted to report a broken parking meter. 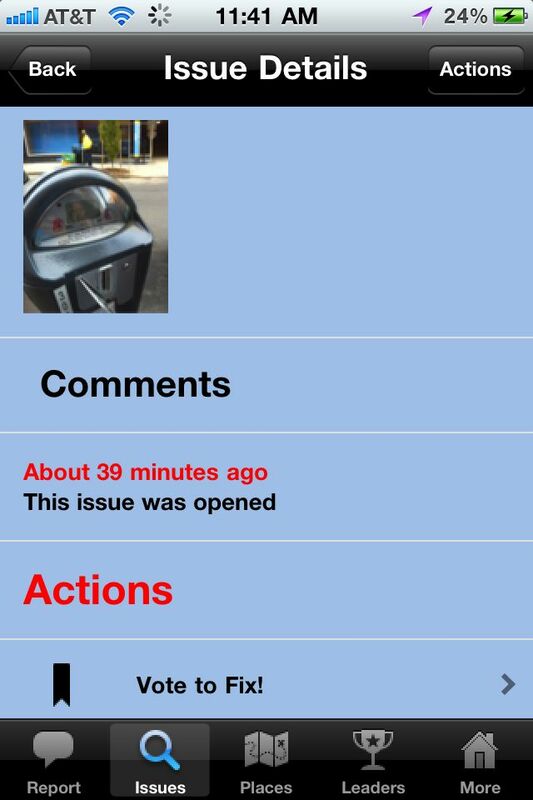 Now we can publicly document our broken parking meter with a photo and a GPS location provided by our mobile phone and it will integrate directly with the city's existing business process. 1) A positive feedback loop for the citizen who has chosen to speak up. One less opportunity to feel trapped and frustrated with the governing institution and one less excuse to become apathetic. 2) An opportunity for the government to effectively harness the power of the crowd and start to get a complete bug report on the municipal fabric of the city. 3) A network effect of engagement that scales exponentially as the conversations and reports that spin out of an open system of government bounce off of each other and spin up greater participation. Personally seeing the effect of SeeClickFix on the how someone reports a parking meter at a time when we are thinking about how to "Fix" the public schools gives me great confidence that a citizen driven disruption of the Public Schools is not only needed but will also be effective. Four days ago, isssue #61718 was posted, reporting that due to a change in the timing of a traffic light on Whitney Ave, there has been increased traffic. According to the SeeClickFixer, "Before the new system came online, a maximum of 5 or 6 cars on Armory would have to wait for a green light, the lights would change quickly, and there would be enough time for all the cars to get onto Whitney. Under the new system, the light turns green less frequently and for a much shorter time, resulting in a backlog of 10 - 12 cars at peak rush hour times. " Joe Pantalone is a man who gets things done. Arriving in Canada at age 13 as the son of Sicilian immigrants, he grew to love the people and politics of Toronto. In 1980 he was elected Toronto Alderman and has been hard at work for his community ever since. We love people like that -- people with a passion for all things local. Joe's website reveals one of his goals: making city government more accountable and accessible. That’s our cue! Enter SeeClickFix, ready to build bridges between citizens and government. Ready to make good things happen. Election Day for Toronto is just around the corner, and Joe (currently serving as councillor and deputy mayor) is running for the mayor’s office. He introduced SeeClickFix to his community during his final campaign speech, as reported today by CityNews of Toronto. While SeeClickFix is primarily used for reporting 311 issues and problems in an area, Joe’s speech highlighted the opportunities for funders, volunteers, and non-profits to collaborate on “projects” that might be opened or suggested through SeeClickFix, like the need for a new playground in a neighborhood. The candidate seemed excited about the chance for development and improvement in his community and suggested that citizens “watch” their neighborhoods for chances to help out. At BIF6 in Providence we were asked by Torch Innovation to come up to Toronto for a speakers series aptly titled Unfinished Business. The event, Disrupting For Good, by all means was a success. We got a chance to tell the founding story of SeeClickFix as well as some user stories. Of course the biggest hit was telling the story of Juli who painted her own crosswalk in New Haven. During the question an answer period a gentleman smartly requested that the Dave Wallace CIO of the City of Toronto and Ryan Merkley of the City of Toronto, both in the audience, come up and speak on Open Government as he was not sure when he would get to hear from his public officials again. @Remark: What do cities like detroit do with no budget to pay for repairs? My Answer: Be open and honest that they can not repair the potholes and do it publicly in the comments section on SeeClickFix. And use SeeClickFix to manage constituents complaints as its free. Dave Wallace: How do you feel about collaborating w/ other developers, cities and apps contests? Answer: We want to help spark innovation in the open government space and think of ourselves as a platform. If you build a better app we hope you'll connect it to SeeClickFix so other governments and citizens can use it. SeeClickFix User Patcon: Can I use your API to build a game layer on top of SeeClickFix? At one point in the conversation I acknowledged the new wave of muni workers who are embracing open government and pulling the pins on the open government hand grenades when we toss them over the walls. A good conversation w/ intrigued web dev's inside Toronto 311 ensued. Much of the questions are around change management and simplifying bureaucratic process. How many questions are too many when talking to a citizen? Keep it simple and adjust your business process to the info that they are willing to give. How can we trust that the new wave of data is accurate? More people providing more information will make the data more accurate - look at the Wikipedia. Will this create a new burden on the system? The system that exists will go away and the resulting distribution of information will become cheaper (goodbye call center) and allocation of resources more efficient. We strongly believe that governments need to make the change to open and less constricted processes weighing the benefits of the outcome over the nuisance of adjusting. The open government process changes the way we do government and as such the culture will not adapt to the government, the government has to adapt to the culture. In the end if the city employees have trouble shifting policy from the outside we suggest that they go outside and just start reporting issues on an open platform. As part of announcing our Open Government platform, Lincoln Chafee's independent campaign for governor of Rhode Island asked supporters to take some time this past weekend and log issues on SeeClickFix, an effort we delightfully called a SeeClickFix Storm (credit to Owen Johnson). The idea was to get Rhode Island citizens using SeeClickFix en masse statewide, and more broadly, to show citizens what open government - what participating meaningfully in the work of governance - can mean. Supporters were asked to 'storm' their neighborhoods throughout the state, and invited to 'storm' Providence by bike with me on Sunday. 1) Post the storm online - create a Facebook event, blog post, and/or other online home for the storm to live. If you're posting the storm on your website, add an SCF widget so folks can report issues on your site and see issues being reported as you storm. 2) Create a watch area - create a watch area for the area you're storming, so you can track issues logged pre-storm, during storm, and post-storm, and report your success. 3) Set a goal - if 14 issues doesn't qualify as a storm, what does? Check your watch area for previous activity, and using that along with your estimate of the number of people who will participate, set a realistic but ambitious goal. Along with better enabling you to gauge your success, it'll give participants a goal to aim for! And of course you can shower them with prizes and gifts and awards and brownie points if they succeed. 4) Promote the storm widely - SCF is of interest to a diverse contingency, including community groups, geeks, activists, and more. Don't limit yourself to your email list or Facebook group; leverage the fact that SCF has broad appeal to promote your storm to local MeetUp groups, blogs, and more! 6) Brand your logged issues with your cause - change your SCF profile pic to the Trust Chafee logo, add a quick 'Vote Chafee!' at the end of each issue logged, or do something to promote your storm's cause. This is the beauty of a SCF Storm as a campaign stunt: in Ghandian terms, that voters get to see the campaign being the platform it wishes to see in the world. But in order for them to see that, you need to show 'em. 7) Brand your SCFers - wear campaign paraphernalia as you storm! See image above. And same rationale as previous. 8) Document your storm - take photos, video, otherwise document your fantabulous storm, and ask your stormers to do the same! 9) Report back - follow up with participants, post on your blog, and otherwise report back to the world on how the storm went, including photos & video, activity in the watch area, and encouragement to keep using SCF. Senator Tina Muña Barnes of Guam doesn’t just utilize SeeClickFix: she’s promoting it as “a great way to help the mayors help their villages” according to an article released today by the Pacific News Center. The mayors of Guam are responsible for their villages much as the mayors of the continental U.S. are responsible for their cities and towns. And they face the same challenges when it comes to fixing everyday issues in their communities. Senator Barnes is enthusiastic about the ways SeeClickFix can empower the citizens of Guam. Acting as a direct connection between people and their local services, SeeClickFix routes reports to made in Guam to the appropriate mayor, or to one of the service providers like the GPA (electric provider in Guam) or the GPD (police department), among others. Senator Barnes has served several terms in the Guam Legislature and is known for her passion for community. According to her website, Tina Muña Barnes “is committed to public service and continues to remain active with a variety of community service groups and organizations.” She has also “worked hard this past term to ensure that residents have a strong and capable voice in government.” That’s exactly what SeeClickFix is about: getting citizens involved in the work of improving their neighborhoods and cities. No wonder the Senator is advocating the platform -- it just works, and it works across all cultures and government types. She will be presenting SeeClickFix to the Mayor's Council of Guam tomorrow. Manor.Govfresh was a fantastic experience. Innovators from all over America shared and learned about better ways of leveraging new technologies to benefit cities and citizens. Great minds from small towns, creative ideas from industry gurus, and plenty of friendly networking made for a productive weekend -- SeeClickFix was honored and excited to be part of it. But you don’t have to take our word for it -- this nifty video was published by Manor New Tech High, which they put together to capture attendees’ thoughts and insights. Preach it, Kam -- open government means accountable, accessible government. And that’s what SeeClickFix is all about. You may have noticed a year ago that our mobile website went from looking crappy to beautiful. You may have also noticed that our regular website got a refresh a couple of months ago. Both of those aesthetic changes were implemented by our now full-time UI designer Daniel Stainback. The story of how Daniel came to work for SCF is similar to how Jeff and Kam came on board with SeeClickFix as well. They saw an implementation of an idea that they liked and were inspired to make it better. In Daniel's case however, he was not actually formally invited to improve on what we had created. Daniel took the disruptive route and showed up at dinner one night baring a grin on his face and a newly redesigned SCF mobile web experience on his phone. We were instantly blown away and asked him to get to work on integrating the skin. That mobile integration led to his work on the redesign of our site and recently a gig with SCF. Bus Stop Gets Makeover, With School Spirit! Issue #59089 was posted on September 28th, reporting that there was graffiti covering a bus stop from top to bottom. The bus stop is located right across George Washington High School football field on a high traffic road in Mangilao, Guam. Yesterday it was reported, "Issue resolved. Perhaps George Washington High School volunteers painted the bus stop because they used their school colors. Nice job Geckos!" Not only was the bus stop completely repainted, but it was screaming with school spirit! There is some concern at the Federal Level that Open Government is a democratic fad set to go out of style with a changing of the guard. At some level I understand the concern. There was a synergy, not to be taken for granted, between the Federal Open Data movement and the local open government movement. This is a disruption and open government was coming to the government whether the government asked for it or not. This in not a Democrat or Republican agenda. This is a good government agenda. Political candidates as well as elected officials on both sides of the aisle as well as their constituents understand the value of greater participation and transparency whether you support gay marriage or are pro-life. Everyday citizens have now started to experience the positive reward of a more open society and a government that can dynamically adjust to that. Even if a political party wanted to take that away they could not. Being engaged is fast becoming the norm and apathy is dying. The doors have been opened and two many people are in the entryway to close them again. Today in Rhode Island and Independent candidate for Governor is hosting a SeeClickFix Storm on the heals of his announcement for an Open Government platform for Rhode Island. What is SeeClickFix storm and why is a Gubernatorial candidate starting one? An SCFStorm is an opportunity for a community to go out and blanket their neighborhoods with documentation of the things that need to be improved. They will post it publicly on SeeClickFix and surely meaningful resolutions, and if not that, conversations will come of the issues that are documented. Average citizens will be voting with the web and their smartphones for better communities weeks before the voting booths open. It is a promise that no matter who gets into office there will be active community participants who will advise their elected officials the other 364 days out of the year. As it turns out I received an email from a friend of the opponent yesterday asking if we would endorse their candidate. We we want to be very clear that we are not publicly endorsing any candidate. We are however endorsing an open government platform and would love all political parties to do the same. "With this 'SeeClickFix Storm,' we can start using SeeClickFix statewide and getting community issues fixed. And more broadly, Rhode Island citizens can participate in the work of government in a meaningful way." - Lincoln Chafee, Independent Candidate for Governor of Rhode Island. 2.5 years ago we could not get the City of San Francisco to embrace open civic reporting. Today they are at the forefront of the Open Government movement. And that cultural shift has spread everywhere...Just last week four democratically elected Councilors in Saudi Arabia (A federal monarchy) signed up for open government with SeeClickFix. The world has changed and closed society can not have it back. SeeClickFixer Linda posted issue #53324, reporting that there was a problem with cars running stop signs and speeding in her neighborhood. After this issue was reported on the SeeClickFix map widget on the WECT website, they decided to help bring a resolution to this problem by contacting the Sherrif's office and letting them know about Linda's issue. Check out the results reported in the story below! After an investigation of the New Hope Road Bridge that crosses I-85, WBTV got their solution after contacting the NC Department of Transportation. WBTV got their lead through a report posted on SeeClickFix. The NC Department of Transportation has reported that "We have a list of bridges that require pot hole patching, and Gaston Bridge number 350002 is on our list. We will be getting to it very soon." WBTV concluded their investigation saying "Another See, Click, Fix investigation...another issue solved." What's the point of a dedicated bike lane if it's unusable? That's the question that an article in today's New York Times raises after analyzing the results of a new report prepared by Manhattan Borough President Scott Stringer. Among other findings, the report states that "pedestrians walk in the lanes; cyclists travel the wrong way in the lanes; cars open their doors into the lanes; motor vehicles, including police cars, taxis and other city-owned cars, park in the lanes." In short, even though dedicated bike lanes have been heralded in many cities like New York, some of these local governments may not be providing enough enforcement to make them functional for potential users. We have an answer for you: report these problems on SeeClickFix. Groups like Brooklyn's Community Board 14 have been working with us to integrate SeeClick Fix with their websites, so that citizens can report issues like those found by Stringer. In fact, we will be meeting with Stringer's office tomorrow afternoon to map out new strategies for his office to discover other issues affecting citizens in their community. So keep reporting these issues! Public officials are paying attention. The Morning Journal recently reported that after numerous issues have been reported on SeeClickFix, that one of the busiest roads, Oberlin Avenue in Lorain, will begin to undergo roadwork. The street is getting a whole new makeover with a new asphalt surface, base pavement repairs, replacement of deteriorated utility castings, pavement markings and traffic signal loop detector replacements. The project is projected to be completed by November 19th. Already within the first day of construction, one Morning Journal user seemed pleased with the progress so far, "Serious business. They've got Oberlin Ave. from W.Erie to the tracks chewed up. It already looks better. " Its a good sign for Open Government when Gubernatorial Candidates start speaking the gospel. Lincoln Chafee, independent candidate for Governor, today announced that as Governor he will issue an Executive Order on Open Government, through which he will implement a plan to utilize modern information technologies to make government services easier to use, government operations more transparent, and government more efficient overall. Chafee’s Executive Order will also set standards on the quality and accessibility of government information, ensuring that high-quality information is shared both internally within government, and externally between government and citizens. On the plans are user friendliness of the State website and easier access to public information. Specifically Chafee intends to implement SeeClickFix for neighborhood problem solving as well as Govloop for connecting to Gov peers in other States. To kick off the campaign supporters in Providence are organizing a SeeClickFix Storm to start documenting neighborhood concerns sponsored by Chafee for Governor. Think a fire hydrant is an important part of a healthy community? Think its important to keep them in repair and notify the fire department when they are missing, leaking or in need of maintenance? Our users in New Haven do and apparently after two weeks on the job the new assistant Chief does as well. One of the nice things about transparency is that you get to celebrate all the good things public officials are doing for our community as well as keep them informed of bugs in the public fabric. 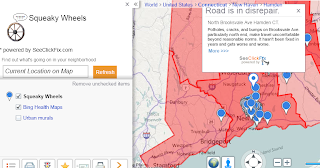 Microsoft Employee Marc Phillips used the SCF API to integrate our data set with Bing Maps. Aside from looking beautiful you can now compare active SeeClickFix communities to public health data as well as 60 other data sets in the Microsoft Map Apps set. Cool stuff? Yeah we think so! We strongly believe that the health of our communities is dependent on the willingness of residents to become citizens and speak up and take responsibility for their communities. Does the data proof it? We don't know but we're sure someone will tell us soon enough as our data set grows and these applications expand and refine. Play around and let us know if you find any fun correlations. Someone should look at the number of food carts to potholes ratio...now that seems important! 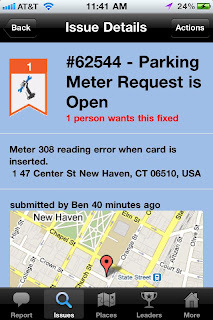 The SeeClickFix map app is called Squeaky Wheels if you are looking for it. On September 17th, the unfortunate destruction of Hurricane Karl left flooded streets, fallen trees, knocked down power poles, mudslides, numerous damaged properties, and thousands homeless. Thanks to a new site www.ayudaveracruz.com, administered by Ernesto Zamudio, SCF will be helping aid the efforts in Veracruz by allowing citizens to report where assistance is needed through the SCF map widget. "In an effort to help Veracruz from this far away, I decided to create a site and searched for a web app that would go beyond posting news or just a simple chat," Ernesto told us. Once he discovered SCF, a request to create a watch area in Veracruz was posted right away. SeeClickFix is happy to help support Veracruz and give citizens a voice during this time of disaster. Stay tuned for future updates on the status of Veracruz! 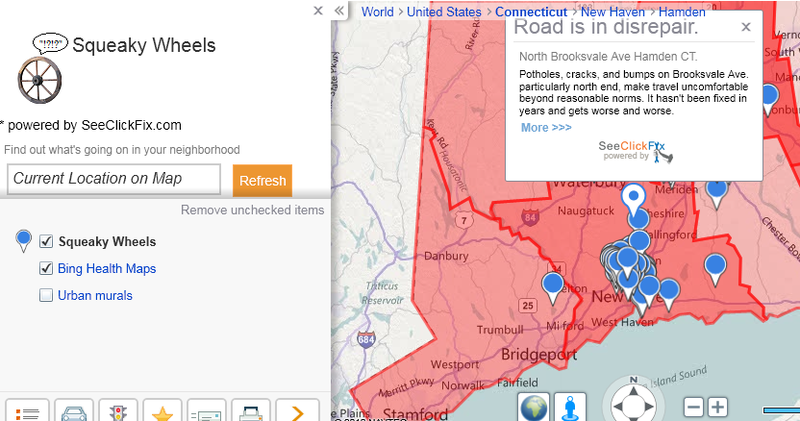 The hyperlocal blog Bridgeport by Steve Vance, was launched today with a SeeClickFix twist. The blog aims to "promote Chicago, the Bridgeport neighborhood, and its many local businesses." The SeeClickFix map widget sits nicely to the right of his blog, where visitors can report issues and view other issues reported by fellow Bridgeporters. Reported September 22nd, issue #57884 "graffiti southbound towards Yona" indicated there was graffiti on the Yona bridge going southbound in Guam. Within 11 days, the graffiti was painted over by a local citizen. The happy citizen reported, "Issue resolved. One hour on a Sunday morning and a little bit of paint is all it took. Yay seeclickfix!" Reported by Maple Leaf Life, Seattle recently announced that they will be adding three crosswalks between the dangerous intersection of Roosevelt Way NE And 92nd St. The issue was brought to their attention after the issue was reported on SeeClickFix. The reporter to the issue had explained that "many people attempt to cross Roosevelt at this intersection and it's very very dangerous. The crossing flags simply do not cut it. Families attempting to cross are simply not seen by drivers." After the issue had been reported and carefully studied, the Seattle Department of Transportation decided to implement three crosswalks that are projected to be installed by the end of 2010. On September 29th, SeeClickFix tweeted out to our fellow SeeClickFixers to see if anyone wanted to help volunteer to move issues to their right locations. These issues were found floating at a longitude and latitude of (0,0). In one weekend, our star SeeClickFixer Cooper, helped relocate 25 issues to their correct location. 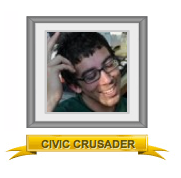 Cooper definitely deserves some civic pride! SeeClickFix will be attending Macrowikinomics Discovery Day October 9th, 2010 from 4-6 p.m at Open Plans, a non-profit technology organization focused in civic engagement and open government, in New York. 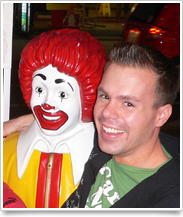 Co-author, Anthony Williams will briefly chat about his book Macrowikinomics. Following Anthony's discussion, innovative groups including SeeClickFix, will share share plans and projects that are focused on innovation, collaboration, and the web. The event will be streamed live across the world with other participating cities of Discovery Day and 350.org. In February, I saw an article about Tucson, Arizona, using SeeClickFix.com (SCF) to report potholes and reported the 2-foot pothole in my neighborhood. Wow, it was fixed in a few days! I never thought the city could be so responsive, this is great! Commuting by bike, I see graffiti (tags) on utility and light poles, utility boxes, signs, curbs, everywhere. The tags are a visual blight in the city, a cancer, a disease to be treated. Because SCF allows users to post other types of issues including graffiti, I hoped with SCF, I could help the city fight this disease and keep the vandalism from lowering our property values. The article I read did not say the City was using SCF for anything other than potholes, but it is worth a shot. I used SCF to report some graffiti near my neighborhood. A couple of months later while searching for something else on the city’s web site, I found that the city has a web form and email address to request graffiti abatement. I quickly realized the city’s form and email address are black holes. There is no tracking or feedback mechanism. In July, when a wall near my house was tagged, I used both SCF and the City’s web form. The graffiti was removed in a few days. The graffiti reported previously was still there. I had found a way help clean up the city and track the reports; report the graffiti using SCF and the city’s form. The city’s Graffiti Removal Program said they do not monitor SCF, so if I used the SCF mobile application, the city would not see the issue. Entering the information twice was becoming a pain. I had to find a way to streamline my reporting process. On SCF, I would include the address in the description of the issue, forward the "Thank you for reporting your issue" email to the city and bypass their web form. This reduced the amount of typing. The Graffiti Removal Program is in the same department (transportation) that is fixing the potholes. I wish they would setup a watch area and get alerts. Wait a minute; I can setup a watch area for them! I created a citywide watch area filtering on the key word graffiti and added their email. Now they will get alerts about graffiti within the city and I can use the mobile application! Now that I have a system worked out, what do I put in the reports? I know the crews use different processes to abate the graffiti based on what the graffiti is on, so I include details they will appreciate. I include the exact location so they can find it, what the graffiti is on, painted or unpainted, block or wood, etc. so they know what to prepare for. I include the color of the graffiti although I do not bother including the characters. As long as the City funds the program, I will report the graffiti I see. Theodore Roosevelt said, "Do what you can, where you are, with what you've got." I think he would have loved SeeClickFix. It was reported today on WBTV, located in Charlotte, NC, that road markings outside of Whitewater Academy will get repainted. Through SeeClickFix, it was reported that the yellow and white lines, and turn signs have been faded since the school opened in August of 2007. WBTV decided to become proactive with the issue and contacted NCDOT and Charlotte DOT. The result; within the last 48 hours they received good news that "the developer, Crosland, is in the process of widening the roadway and adding a left-turn lane and asphalt overlay." Temporary pavement markings are set to be made within the next week!